There are many Swiss makers of luxury watches, and if you just want to go with an established brand, you’ll still have a lot to choose from. Truth be told, there isn’t much that separates many of these established makers, at least in terms of quality. Rolex, Pateck Philippe, Jaeger le Coultre and Piaget, among many others all make a fine quality watch. Once you’ve made the decision to buy from any of them, it’s simply a matter of deciding what features and design you want in your watch and taking it from there. 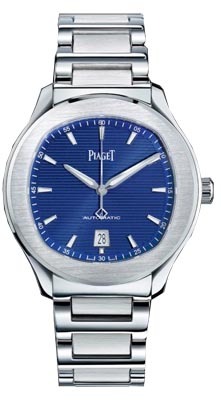 If you choose Piaget watches, you’re looking at a company that was established in 1874. They originally made pocket watches and clocks, and later just watch movements. Now, they’re among the world’s finest manufacturers of watches as jewelry. But they offer more than that, as they also offer fine styling and a history of innovation. They’ve got it all, provided that you have the wallet. Read on for the full Piaget watches review. The build quality is exceptional, and as good as any timepieces on the market. While a few models in the product line have stainless steel cases, most have cases of either gold, rose gold, or platinum. A couple of their higher end models even have case backs of machined sapphire. All have rock-hard sapphire crystal protecting the watch face. Water resistance varies, but some of the sportier models have resistance exceeding 100 meter. Since most Piaget watches are sold as jewelry and will likely be worn as such, such water resistance is more than adequate. The company has a history of building their own movements; after all, at one time, the company was a supplier of movements to other manufacturers. All of their watches feature mechanical or automatic movements of their own design. Complications abound, as well, so if you’re so inclined, they’d be happy to provide you with a watch with dual time zones, moon phases or a perpetual calendar, or a tourbillon. 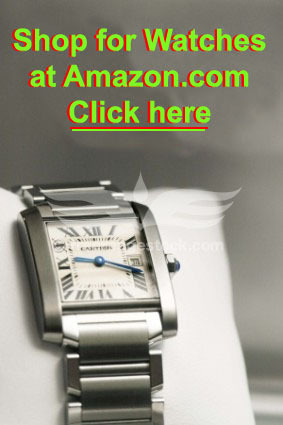 Click here to shop for Piaget watches at Amazon. The company has a long history of innovation, but what they’re best known for is making a watch that is thin. By thin, we’re talking about the distance between the crystal on the front of the watch and the back of the case. 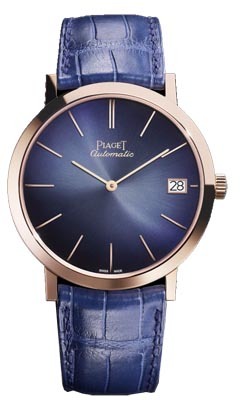 The breakthrough movement for Piaget watches was the 9P, introduced in the late 1950s. This mechanical movement was just 2 mm thick. They later improved upon this with the 12P, which was an automatic movement that was just a bit thicker, at 2.3mm. Their calibre 600P took all of this a step further by building a movement with a tourbillon that was just 3.5mm thick. It’s one thing to build a thin watch, but you also have to build a thin case and make sure that it’s both attractive and rugged enough to protect the movement inside. Piaget watches have successfully done this for years, and they continue to offer ultra-thin watches today in their Altiplano line. We’ve largely covered the features of Piaget watches already; they’ve got a huge variety of complications for those who love them, and simple, elegant basic watches for those who like a more austere look. They’ve also got a lot of bling available, as some of their watches boast literally hundreds of diamonds on the bracelet and around the watch face. Colors are available, too; the Altiplano line for women offers watches in blues, greens and reds. 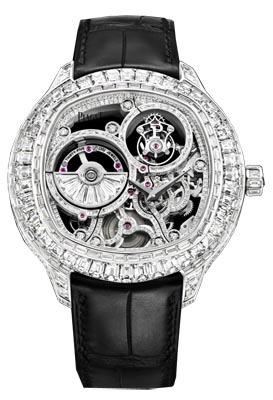 More masculine models include chronographs and the aforementioned tourbillon models. If you like a more basic watch, their Polo S offers a nice, elegant basic timepiece with a stainless steel case. It may not have a diamond mine aboard, but it’s still going to look great. Care and maintenance is a bit more complicated than with most watches, as they all have mechanical movements. That means that every 3-5 years or so, you’ll have to send the watch back to the company or to an authorized repair center to have the watch serviced. There, a technician will disassemble your watch and examine it for any damage, wear, or broken parts. Parts not working correctly will be replaced, and the entire watch will be reassembled, cleaned, and tested. With proper care and appropriate maintenance, you’ll find that these watches will likely last for decades. For all of their luxury and build quality, the warranty offered with the purchase is average. That’s not to say that it’s bad, but rather to say that the warranty is the same one offered by probably 90% of all watch manufacturers. When you buy, you’ll find that the company warrants it against defects in materials and craftsmanship for a period of two years from the date of purchase. As these watches are thoroughly tested at the factory prior to being shipped to retailers, legitimate defects are likely quite rare. Well, there’s no getting around it – These watches are expensive. Period. Prices start at just under $10,000 and from there you can easily spend six figures if you’re so inclined. Models at the low end feature stainless steel cases, and models with gold, diamonds and elaborate complications sell for much, much more. On the other hand, these are high quality timepieces and fine pieces of jewelry that are limited in production and may well hold their value over time. Like many luxury brands, these watches are sold through the company directly and through select retailers. This is done to avoid “diluting the brand” through heavy discounting. As such, you’ll pretty much have to pay full list price if buying through the company or one of its authorized sellers. While you can buy online at the company’s Website, they only sell a small number of watches there. Most are only available for in-person sales. It is also possible to buy through third parties in what is known as the “gray market.” A number of reputable and prominent online retailers sell the brand, and it’s there that you’re most likely to find a discount. You probably won’t be able to choose from the entire product line, but larger retailers will probably have a good representative selection from which to choose. Piaget watches have a long history of offering beauty, features, innovation and precious metals and gems. It’s a nice combination for those who have the money and for those who want to own a truly stunning watch. Their Altiplano line still offers some of the thinnest watches on the market, and the company is one of the few to offer watches with both diamonds and multiple complications. If you like beauty and luxury, it’s hard to go wrong with Piaget watches.